Bluegrass Brewing Co. | Beer Apprentice - Craft Beer News, Reviews, Interviews and Info. Category Archives: Bluegrass Brewing Co.
Hello everyone. Thanks for checking back in on another craft beer review. Today, I’m going to be trying the Bluegrass Brewing Company Saison produced by the Bluegrass Brewing Company located in Louisville, Kentucky. I’ve had most of the beers they produce, however I’ve never tried their Saison. I couldn’t find any sort of commercial description from the website, bbcbrew.com, so let’s just see how it is for ourselves. Shall we? This beer came in a 12 oz. bottle and it had an ABV of 5.2%. It poured a somewhat hazy, amber to orange color with a barely off white head that was huge in size, very soapy and very fizzy. The retention time was only so-so and as it settled it left behind some loose lacing that fell back into the liquid fairly quick. The nose was very, very light. An insignificant funky barnyard note. A little was there, but not much actually. Some grain and grassy notes as well as some type of fruit. Like white grapes or something. A touch of lemon was found too in addition to a minute amount of peppery spice. The taste was also very light and subdued. Some funkiness. Hardly any acidity or tartness was to be found. The peppery spice did seem to come through a tad bit more than it did in the bouquet, however it was still nothing to get overly excited about. Some floral savors and some grassy tones added a tad bit of complexity while a slight relish of lemon came through at the back end. The mouthfeel was medium bodied. Dry, crisp, refreshing and thirst quenching. The carbonation was very lively and a decent amount of flavor was left behind between sips. Well, this beer was ok I guess. It’s an easy drinker and the flavors did become a little more prevalent as I went along, which in turn made the beer somewhat better. This would definitely be a brew that could be an introductory Saison and I think it would pair well with a scorching hot day in the Summer. 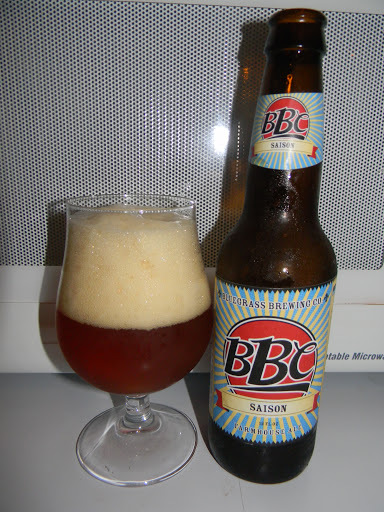 Although, if you are searching for a “world class” Saison, you may want to look for something besides the Bluegrass Brewing Company Saison. Don’t take my word for it though. As I’ve always said, this is just my opinion. Heck, pick up a bottle and see what you think. You may love it. Hi folks!!! Today, I thought I would share with you a recent trip I made to the Bluegrass Brewing Company 4th Street at Theater Square in Louisville, Kentucky. The Bluegrass Brewing Company (bbcbrew.com) currently has three locations in Louisville. The first one, BBC East in St. Mathews, opened its doors in 1993. Followed by the 4th Street location, which served its first beer in 2006, and the most recent addition, the BBC at 3rd & Main, cutting the ribbon in 2010. The Bluegrass Brewing Company makes very solid brews and it was actually their Summer Wheat, at this location no less, that got me started on this craft beer journey, so this particular spot holds a very special place in my heart. The BBC also gives us Kentuckians a little something to be proud of when it comes to craft brewers and craft brewing, therefore I am always willing to support what they have to offer. I have had the opportunity to visit the 4th Street location (660 South 4th Street) numerous times and I have enjoyed every visit. This particular facility is very nice and clean. They have both indoor and outdoor seating with retractable glass garage doors separating the two seating areas. The bar is accessible from either vantage point, which creates an enjoyable atmosphere. They, like most brewpubs, have a chalkboard display that has a list of the brews on tap for the evening. They offer samplers so as to get a taste of everything and this pub also serves a wide variety of spirits and domestic beer in the bottle if you happen to be visiting with a friend who is not a craft beer drinker. They have a small selection of merchandise and will also let you purchase 6 packs and “bombers” of some of BBC’s most popular brews. Plenty of seating was to be found and an extra area was even located toward the back just in case it became overrun with patrons. The pub also has the option for growler fills of anything they have on tap. I took my seat near the bar and decided to order a bit of food and sip on my first beer of the night. They have a wide selection of sustenance, but I decided to keep things relatively simple by ordering the beer battered fish sandwich on wheat bread along with BBC’s original recipe tarter sauce. I chose to keep my sides to a minimum by choosing only a pickle and hand cut, homemade, BBQ potato chips. The price was adequate and the portion was more than satisfactory. The service was prompt and most importantly, the food was excellent. But, I didn’t come here to focus on the food. I wanted the beer!!!! I decided on the Altbier with dinner. It’s a classic German Amber Ale with an ABV of 4.19%. This brew had a very nice amber color that had a light tan head with not much size, retention or lacing. The aroma and taste had a decent waft of caramel malts and toasty goodness. It paired well with my meal due to the fact of the low ABV, medium mouthfeel and ease of drinkability. After I finished my meal and sucked the last drops of the Altbier I decided to move on to another brew. But what? After pondering for a few moments, I decided on the APA. This brew had an ABV of 5.79% and 55.2 IBU’s. It’s brewed with both American and English hops. It had a nice, light amber/dark orange color with some burnt orange highlights showing through. Once again, the slightly off white head was minimal in size, low in retention and sub-par with the lacing. The aroma had both a floral and “earthy” hop tone. Some citrus (peach) and grassiness with a touch of caramel and butter. Not bad at all. The taste was more of the same with substantially more caramel malt and “earthy” goodness. Plenty of bite and a nice tinge of bitterness. The mouthfeel was medium, quite dry and left a little flavor behind for me to enjoy. My third and final beer of the night was the Bourbon Barrel Smoked Stout. An 8.5% brew that I couldn’t wait to get my hands on. This brew was black in color with some noticeable ruby highlights swirling at the bottom. Like all of the beers I received this night, the tan head was meek looking with little retention time and obscure lacing. The brew had an unmistakable aroma of smoke intermingled with the Kentucky Bourbon. Most definitely some dark fruits and roasted malts were detected also. The taste profile was very similar only that I thought the smoke stood out a touch more. I liked it. The mouthfeel was medium and dry with a quick burn followed by a soothing warmth. The flavor did not completely coat the mouth like I thought it might, but that was ok as the beer was still very tasty. As always, I enjoyed my visit to the BBC 4th Street location. It’s, for sure, a place I will continue to frequent when I happen to make the trek to Louisville. I would recommend that if you are in the area to swing by one of the three locations and enjoy the atmosphere. Sure, it’s still a relatively young brewery/brewpub, but the beer is decent, the food is good and it just makes for an all in all good time. I hope they continue to grow and expand. I know their distribution area is not that grand, but maybe over time it will become more readily available. I also like the fact that not only do they keep the old standards on tap year round, but they also have a specialty brew that changes with the seasons…… just like the “big boys”!!!!!! Thanks for reading everyone. 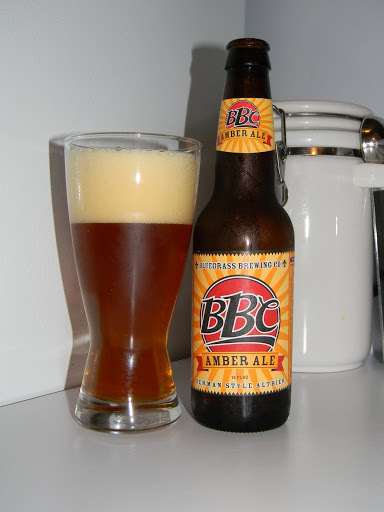 Until next time…..
Posted by Beer Apprentice on September 25, 2011 in Bluegrass Brewing Co.
Today’s craft beer review is of the Amber Ale (Altbier) produced by the Bluegrass Brewing Company located in Louisville, KY.
It’s always fun to sample and support a beer from my home state, so I’m looking forward to trying this one. Here’s the description from, bbcbrew.com. Altbier, literally translated as “Old Style” beer, is a classic German ale. BBC Altbier is brewed with additions of Munich, wheat, caramel, and chocolate malts creating a delicate, but flavorful malt profile. This delicious amber colored session beer is balanced with additions of traditional spicy German hops creating a light and floral bouquet to compliment its complex malt profile. This beer came in a 12 oz. bottle and had an ABV of 4.19%. This brew poured a decent little amber/copper color with some burnt orange and yellow highlights around the bottom. It’s mostly clear with a very light tan head. It was slightly creamy and fluffy. Well sized from an aggressive pour. The retention wasn’t bad either (most BBC brews have little to no retention time). I thought the lacing was sub-par, but it still looked fairly enticing. The aroma revealed a little bit of burnt brown sugar and sweet caramel. A small trace of nuttiness was discovered along with a wheat bread appeal. It almost seemed like it had some type of Christmas spice in the nose. I don’t know, it could have just been me. All of the aromas seemed to be in balance, however they were quite relaxed and abated. The flavor had more of the nuttiness and a tranquil bready malt. The caramel seemed very faint with very little sweetness. A wee bit of a roasted profile helped add a bit of intricacy. Overall, not a whole lot going on with the taste. Rather light and moderate. Nothing too complex or outstanding, however nothing bad or off putting either. The mouthfeel was medium to thin. Mostly dry, smooth and somewhat crisp. A touch of flavor was left behind on the palate, but not too much really. I would have liked a bit more. Well, this beer is nowhere near horrible, but it’s nothing to flip for either. It’s super easy to drink, quite sessionable and made for a pleasant drinking experience, but I wouldn’t go out of the way to pick this up. I think this could be a great “introductory” craft beer and I also think this could be best enjoyed during the Fall season. It’s a decent no-nonsense beer. If you see a bottle, pick it up and give it a go or better yet, go by the Bluegrass Brewing Company in downtown Louisville and enjoy a pint. It has a great atmosphere ( I personally like the 4th Street location). Have a great day everyone and enjoy a great craft beer.